Your school is a lot more than a center of student learning—it also represents a self-contained culture, with traditions and expectations that reflect its unique mission and demographics. 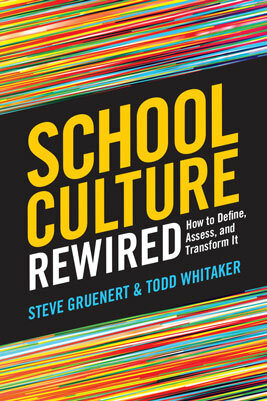 In this groundbreaking book, education experts Steve Gruenert and Todd Whitaker offer tools, strategies, and advice for defining, assessing, and ultimately transforming your school's culture into one that is positive, forward-looking, and actively working to enrich students’ lives. Instructions on how to create and implement a successful School Culture Rewiring Team. Though often invisible to the naked eye, a school's culture influences everything that takes place under its roof. Whether your school is urban or rural, prosperous or struggling, School Culture Rewired is the ultimate guide to making sure that the culture in your school is guided first and foremost by what's best for your students. Learn the nine key actions you can take to shape a new school culture in this infographic.